Locally-defined Dooplaya District corresponds roughly to the southernmost part of Kayin State located to the south of the Myawaddy – Kyone Doh vehicle road and the Gyaing River. It incorporates all or part of government-delineated Myawaddy, Kawkareik and Kyainseikkyi Townships. To the east, the northward-flowing Moei River marks Dooplaya’s border with Thailand south of the Myawaddy– Mae Sot Friendship Bridge, down past Three Pagodas Pass to Halockhani. 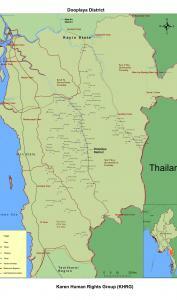 To the west and south, Dooplaya is bordered by Mon State and the northernmost part of Tanintharyi Region. In terms of the locally-defined Karen Districts, Dooplaya is bordered to the north by Pa’an and the south by Mergui-Tavoy, and comprises four locally-defined townships: Kawkareik, Waw Raw, Noh T’Gaw and Kru Tu. 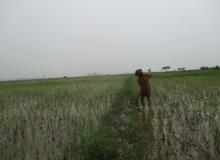 A history of Tatmadaw offensives and militarization in Dooplaya District have contributed to an environment of uncertainty, while ongoing abuse and demands by armed actors threaten civilian freedoms and livelihoods, resulting in the continued practice of temporary displacement along both the district’s northern border and its south-eastern region. This report is discussed about BGF demanded a tax from a local community members for gathering and selling elephant foot yams.